Ah so many manga, so little time/money/time ugh! Most of the time I only buy a new manga volume when I have a� coupon, but alas, I am between coupons. So I had to, gulp, pay full price! Oh well, I really had little choice. Fruits Basket Volume 7 and MegaTokyo Volume 3 just came out. Both of these are likely to sell out their consignment at my local Borders, so I picked them up today. Since most manga sell for anywhere from $7 to $10 per copy, the costs add up quickly so I seek discounts whenever I can. The best discount I’ve encountered so far are the 25% off coupons I get via email from Borders. Just get on their mailing list to get these. Here are the series I’m following right now (in no particular order). I read a lot of other books and manga in between along with tech books and magazines, but the series above are the ones I look forward to. Note MegaTokyo is a web manga which can be read for free, but I discovered it in bound form first and I like Fred so I keep buying them. I also like being able to read a big chunk of the story collected together along with the liner notes so to speak. During my usual browsing at the Borders bookstore near my office, I was surprised to see that they’ve started carrying imported manga in addition to their ever growing selection of translated manga. On the surface this may seem no big deal until one thinks about the dynamics of retail businesses in general and the books business in particular. In general, getting shelf space at retail is very difficult. The retailer only want to shelve things that are going to sell in a reasonable amount of time. Things that don’t sell not only take up valueable space, they make it impossible to shelve new products that might sell better. So when the Borders decided to stock imported manga, they must have believed that they had a product that would sell, even at nearly twice the price of translated manga. With respect to bookstores in particular, finding books in any language other than English is a rare thing in the U.S.. Borders does have a section of foreign books in a number of languages, but this particular one had nothing in any of the non-romance languages. Finding foreign language books usually means a trip to bookstores in ethnic neighborhoods or those near college campuses. In the case of Japanese books, it would mean a long trip to Mitsuwa Marketplace. So again, someone thinks that this will sell. And I should also note that this Borders is located in an area that sees a fair amount of Japanes tourist traffic. So maybe it’s just this store carrying the imports. I’ll have to check some others later. It may be too much to hope for, but perhaps the appearance of imported manga at a mainstream bookstore like Borders heralds the end of American provincialism. Well after some wrestling, I managed to install the upgrades for this site. While checking things out, I noticed a referal link from a Google search on "popularity of manga", so I did some digging and found that one of my blog entries was high on the list of Google results. w00t! Looks like the Sunday that just ended was a bit more active than I would have expected from the beginning, but that could just be all of the caffeine from the tea I’ve been drinking… Anyway, the things one finds on impulsive searches amaze me. I was watching Adult Swim and got curious about the woman doing the bump and grind promoting Aqua Teen Hunger Force, so I hit the AS boards and learned that her name is Lindze. A little googling lead to some video of the commercials currently playing, but it also lead to this! I really gotta stop with these quizzes! I’ve been watching Ghost In The Shell: Standalone Complex on Cartoon Network’s Adult Swim with mixed feelings. Yoko Kanno’s (of Cowboy Bebop fame) music is pretty good, but other aspects of the show, such as animation quality, have been disappointing. The stories had been pretty forgetable until they introduced the Laughing Man backstory. Critiques aside, the show has made me think. Would I want to replace my human parts with machine parts? I don’t have any religious or philosophical prohibitions against cybernetic implants, but I certainly won’t be the first in line to try them out! In a recent episode, the Major hacked into an android maid’s eyes in order to see what she was seeing as a drug deal was going down. In another episode the police depart was illegally using monitors to record everything their agents were seeing (without their consent). Having parts that someone else might hack into is not the warmest thought! So when I saw the story Google Exposes Web Surveillance Cams on Slashdot today and did some poking around, Ghost In The Shell immediately came to mind. Apparently, there are hundreds, if not thousands of web enabled cameras that anyone on the web can connect to. In some cases, you can even control the camera. To test this out, I visited a number of these cameras spread around the globe and saw everything from empty locker rooms in Europe, to convenience stores in Japan. I suppose if I spent more time at it, I’d have found more interesting sights. But the ease of this was rather shocking. It felt rather like a voyeuristic game of Myst. Yet again, security has probably been ignored in the name of ease of use by end users. So why should anyone expect that cybernetic implants should have any more security? You can’t really blame the web cam manufacturers too much. When they started selling these cameras, they may have never thought that they needed to worry about what a search engine would turn up. When cybernetic eyes become available, the security may be up to snuff then, but what about later? Duh! Manga Is On Fire! 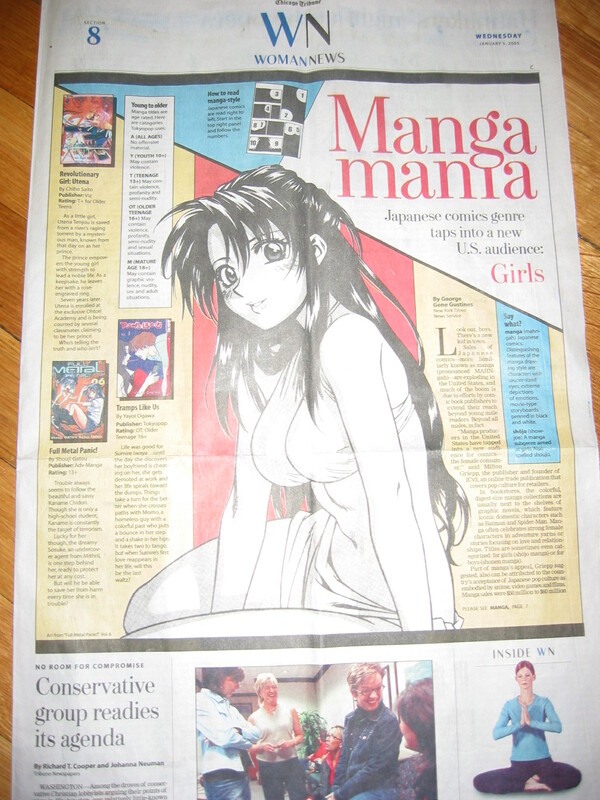 The January 5, 2005 issue of the Chicago Tribune has a story covering the popularity of manga in its Woman News section. 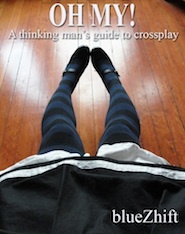 Knowing my interest in manga, a friend gave me a copy of the article (thanks Peggy!). According to the article, manga sales in the U.S. topped $110M in 2003 nearly double the $60M taken in the year before. But the primary motivation for the article is apparently the growing popularity of manga with girls, particularly the shoujo manga which are targeted at girls to begin with. It’s a nice article that will give the uninitiated a fair intro to manga, but it is mainly written in the context of American comics and American views of comics as being fluff for boys. In this sense it paints an inaccurate view of manga and perhaps misses the point of why it is becoming popular here in the U.S. as it has been in Japan for some time. I believe the reason for the popularity here with both boys, girls, and old guys like me, is story! The anime and manga that are making their way to the U.S. have interesting stories and characters which with the mix of an unfamiliar culture and different ways of looking at life, are proving to be a potent brew.With this in mind, the popularity of manga is unlikely to revive traditional, super hero oriented American comics. The article doesn’t go into this in great detail, but does indicate that a transformation may be starting to take place in the American comics industry in response to manga and what it is telling them about what readers want. So expect to see manga style offerings from the likes of Marvel and DC Comics in the near future. One particularly welcome development is publisher Del Rey’s entry into the manga market with two strong offerings from the legendary CLAMP, Tsubasa and xxxHOLiC. Not only are these a couple of my favorites, but Del Rey has given TokyoPop a real run for their money by not only publishing in the manga style like TokyoPop, but also providing contextual information on honorifics and other cultural references (though you’ll also see some of this in Fruits Basket, one of my TokyoPop favorites). For someone who wants to have as authentic an experience as possible, short of learning Japanese and moving to Japan, this is da bomb! For more about manga, I’d recommend Dreamland Japan, it’s a little dated now, but still a good starting point for the academically inclined. Sponge Bob Oh Why? Why? A Series of Unfortunate Events, How Fortunate! The oldest kids are out of school today for the holidays, so the annual question of what to do with them during this time arose once more. Fortunately, I decided to take them to see A Series of Unfortunate Events which was, quite fortunately, quite good. And since this was the first show today, it did not cost….a fortune… Okay, enough of that! My oldest daughter (11) is quite a fan of the series of books on which the movie is based and was not disappointed. She did point out many of the differences between the movie and the books, but by the gleeful look on her face, none of these were show stoppers. Her younger brother and sister, who have not read the books, also enjoyed the show. The acting is good and the movie is well cast. I hope that we’ll see more Emily Browning in future roles. She’s gorgeous! And she has a lot of potential. I haven’t read other reviews of the movie, but as an adult who has not, forgive me, read the books, I think it’s a good movie. It has a surrealistic, storybook feel to it, that just felt right from the bits I know about the books. And Jim Carrey is perfectly cast as the evil/hammy/campy Count Olaf. The trick for adults watching this is to not take things too seriously, which was easy for me since I take very little seriously! The only warning I would give is to those, who like Indiana Jones, are afraid of snakes. There are some scenes that feature a lot of snakes, but the snakes are not doing anything too scary except for one brief scene that is handled brilliantly (no spoiler here!). Hi Ami! Hi Yumi! I had the great pleasure of watching their animated show, The Hi Hi Puffy AmiYumi Show, premiere tonight on Cartoon Network with the kids. I must say that we all enjoyed it a great deal. It was funny and hip, and if you actually like Puffy AmiYumi, as I do, it was a treat. Honestly, I wasn’t expecting much since my memories of band inspired cartoons are such dreck as the Jackson 5’s, the Osmonds (I think), and the Partridge Family cartoon. The stories were all funny without being crass and I really like the groovy retro look. The visual style is a mix of Powerpuff Girls, Dexter’s Laboratory, and a pinch of Samurai Jack with a nice dash of anime influence. The voice acting is good and I like the peppering of Japanese throughout and of course the intros by Ami and Yumi. They also make very good use of Puffy’s music which the kids really like having heard me playing it for the last couple of years. Best of all, Ami and Yumi’s friendship is an integral part of each story. Now that’s cool. 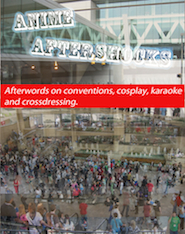 This past weekend I packed up the van and took my crew to Anime Reactor in Rosemont, a Chicago suburb. In short, this late thirty-something guy had a lot of fun! I got a lot of cosplayer pics, attended a good number of panels, and even got up the nerve to sing Shell during Friday night karaoke! Call me strange, but I love the cosplayers and artists, and I love singing Japanese anime songs. The main reason I like Japanese anime though, is because the stories are so much better than most of the crap on tv right now. It didn’t surprise me that the kids had a good time too. They love anime, buying stuff, and pocky! What did surprise me a bit was that my wife was a bit flipped out by the fact that we’re significantly older than most of the con attendees. We were both resident heads at the University of Chicago years ago, and spent a lot of time with young people, so I was doubly surprised by her reaction. But I guess that was because the relationship was different then. At a con we only have to be parents to our own children. She finally loosened up and had a pretty good time too. The age thing didn’t really bother me, I was having too much fun to worry about that anyway! After an initial mix up with the kids’ registrations, mostly my fault, and a big argument, I had thought that maybe this would be the last con I dragged the family to. But in the end, we all had a good time and I think I learned something more about myself and the family I love so much. This old dog still has a lot of tricks left in him.